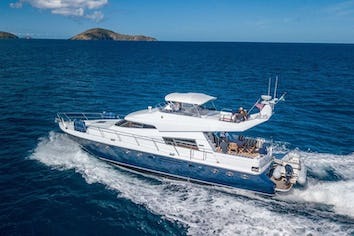 Sea Boss, an award winning Horizon 60 power catamaran, is a custom built, luxurious blue water cruising yacht with a captain and gourmet chef. Her sleek, modern clean lines ensure timeless beauty and will turn heads at every dock she visits. Sea Boss has 3 staterooms and can accommodate up to 6 guests and features an enormous full-beam master suite. Her highly refined and tank tested hull design make for a remarkably smooth, soft and stable ride, regardless of the sea conditions! SEA BOSS can accommodate 6 guests in 3 cabins. The Master forward cabin has a king size bed, shower and toilet. A starboard VIP cabin has a queen size bed, shower and toilet. A portside Guest cabin has 2 twin beds or converts to another King berth, with adjacent shower and toilet. SEA BOSS is fully air conditioned through out, with individual room controls. Wireless Printer/Scanner/Wi-Fi, Wireless sound system, 2 GoPro cameras, 14 fishing rods. Nathan and Laura are waiting to welcome you aboard SEA BOSS. They will take care of your every need, tailoring your vacation to your desires. They will listen to you carefully and with their professional mix of happy go lucky and high-end service you will not be disappointed. Their love for their job will be evident as soon as you meet them and you will be sure to want to continue to sail with them for years to come. Nathan and Laura are highly experienced, award winning crew and have completed over 130 luxury charters since 2011. Since meeting they dedicated their lives to the charter industry and placed much energy in becoming the best crew for their guests, even winning Crew of the Year in 2013 by Trade Winds Cruise Club. Their experiences in their previous careers and within the charter industry, revolving very much around customer service and care, has given them the ability to adapt to any given circumstances, requests and needs of their guests, individually and as a group. Nathan is a captain with many additional skills. Not only does he have an approachable, warm personality but he is also an extremely skilled sailor. He will happily teach you the joy of sailing whilst keeping everybody feeling safe and happy the whole trip. Nathan has an eye for detail and will keep the yacht spotless for your stay. In his previous career he was a very skilled electrician, which enables him to maintain such a beautiful yet technical yacht like SEA BOSS. Nathan grew up on the water, skiing and wakeboarding from an early age. Laura introduced him to the sport of dinghy sailing when they met in 2008 and he was hooked! An obvious natural to sailing and with their love for the water, Nathan and Laura decided together to embark on their sailing career. Laura is a very talented chef and enjoys all aspects of cooking including catering for your dietary needs. Not only is she amazing in the galley but Laura always makes time to be with her guests to ensure that they are happy and receiving everything they need. She has expanded her cooking repertoire by gaining experience through various courses at the prestigious Ashburton School of Cookery in the UK and obtaining her Level 2 Food Hygiene qualification. She’s very versatile and can make a great cocktail as well as help Nathan with sailing Sea Boss. Laura is very clean, professional and is always smiling and happy. She loves to sing and dance and you may catch her doing both of these whilst in her favorite place, the galley! 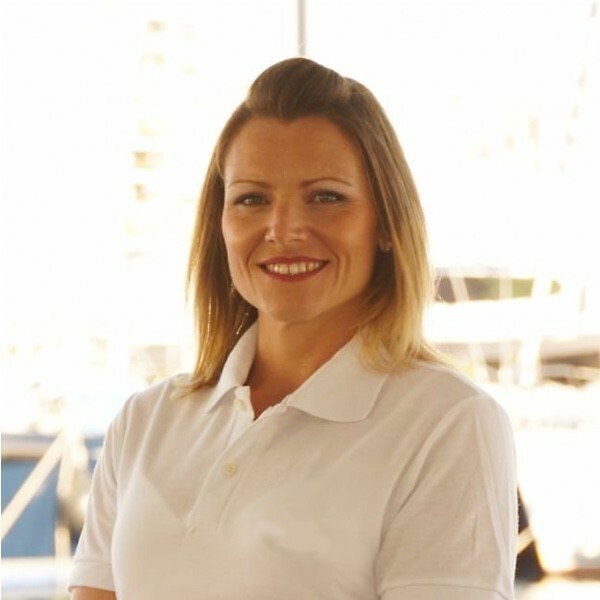 Also a qualified captain and having sailed since she was a child, Laura will ensure you have the greatest vacation you could ever dream of! Nathan and Laura have been married since July 2010 and are the perfect team. They met in their home town in the South West of the UK where they both grew up and now in their 30’s, their fun loving personalities and vast knowledge of the water guarantees to provide you with a unique and unforgettable experience. They take much pride in their work and know only too well how important their professionalism and flexibility can impact your charter to make it the best you have ever experienced. Most of all they understand perfectly how important vacation time is to their guests and focus on their enjoyment above anything else throughout their stay. Berry Burst Croissants Drizzled In Honey And Crunchy Walnuts. Saffron And Pear Risotto Topped With Toasted Pine Nuts And Sautéed Wild Mushrooms. Filo Tart With Caramelized Onion And Brie. Parmesan And Lemon Crusted Salmon Fillet With A Creamy Dill Sauce, Sautéed Seasonal Vegetables And Roast Potatoes. Frittata with Sautéed Garlic Mushrooms And Crispy Bacon. Thai Fishcakes Drizzled with Spicy Peanut Sauce On A Bed Of Asian Slaw And Rice Noodles. Fresh Tomato, Mozzerella And Basil Layered Caprese Salad. Pistachio Crusted, Herb Stuffed Pork Tenderloin, Served with Parmesan Roasted Sweet Potato And Honey Glazed Apple Cubes. Chocolate Fondant with A Warm Wild Berry Compote. Sweet Cinnamon French Toast With Tropical Fruit Medley. Marinated Pineapple And Chicken Skewers With Sweet Mango And Avocado Rice Salad. Beef Carpaccio Complimented With Lemon Infused Olive Oil, Sprinkled With Toasted Pine Nuts, Slivers Of Parmesan And Topped With Fresh Arugula. Shrimp Cooked In An Exquisite Crab, Red Pepper, Tomato And Thyme Sauce, Linguini Pasta, Served With Baked Cherry Tomatoes And A Parmesan Crisp. Baked Lemon Cheese Cake With Freshly Whipped Cream. Eggs Florentine With Pan Fried Basil Cherry Tomatoes. Barbeque Seared Tuna Nicoise Salad, With Gigantic Crispy Croutons And Pan-Fried Balsamic Mushrooms. Mussels Steamed In White Wine, Garlic And Cilantro. Stacked Berry And Greek Yoghurt Waffles, Drizzled In Hot Maple Syrup. Greek ‘Spanakopita’ Feta And Spinach Filo Pie Accompanied By, Fresh Herbed Chickpea Salad. Parmesan And Truffle Soufflé With Pear And Pomegranate Salad. Sweet And Spicy Marinated Mahi Mahi Steaks Served On A Curried Parsnip Mash With Coconut Rice Balls And Steamed Broccoli. Classic Crème Brule With Fresh Berries. Eggs Benedict With Fresh Avocado And Sliced Beef Tomato. Grilled Lobster Tail Dressed In Melted Lime And Garlic Butter Accompanied By ‘Zesty’ Cous Cous Salad. Seared Scallops On A Pea And Mint Puree, Sprinkled With Crispy Prosciutto. Sous Vide Filet Mignon With Creamed Mushroom Sauce Potato Gratin And Steamed Asparagus. Eaton Mess With Home Made Meringue, Drizzled With Strawberry Coulis. Honey Drenched Oatmeal And Raisin Breakfast Muffins With Thick Vanilla Yoghurt. Salmon Tar Tare With Avocado And Beetroot Layers, Drizzled With Parsley Oil. Laura’s ‘Secret Recipe’ Vegetable Lasagna With Greek Salad And Home Made Garlic Bread. Poached Pears In Sweet Red Wine Syrup With Mascarpone Cheese. Coffee And Liquors Offered After Every Lunch And Dinner. After a very stressful and busy year, we were looking forward to our time on the Sea Boss more than ever. We were hoping to show our kids the wonders and the beauty of the BVI, but Hurricane Irma and Maria had other plans. As disappointed as we were, we were thrilled to be able to explore the Exumas in the Bahamas! What an amazing place! The BVI will always have our hearts but the Exumas is a close second. Thank you for the relaxation, fun, food and laughter, we can’t thank you ENOUGH!! -Urgent care on Christmas for stitches! Thank you just doesn't seem enough for making the trip that we hoped would happen- happen! On the heels of the devastation from Irma and Maria and the amazing humanitarian work the two of you did aboard Sea Boss... You hosted Patty and I for our 30th wedding anniversary. Jenn, you were such a treat. Nothing beats waking to the sounds of you in the kitchen and the smell of another amazing breakfast. You faced your fears and tackled the eggs benedict on day 1... Both Patty's and your personal favourite. (Jenn's disclaimer- "whether Kraft Dinner or Eggs Benedict- I am SO nervous to make a guests all time favourite meal, even if I've made it a hundred times") Then meal after meal, just nailed it: bolognese, mahi reubens, pulled pork and fish tacos, salmon fillet.. And we will never forget the dumbest thing we said on the charter to you "Uh, Jenn.. We think we're gonna skip or share some desserts"... No way! And Captain Darrel.. Right off the bat he says to Patty "So Patty, there are two things I have to tell you about swimming in the Bahamas. 1. There's a strong current." She says "I don't care about that. But is the 2nd thing is there are sharks?" "Yup!" But then somehow Darrel coached and persuaded Patty to actually swim with them and touch them! Followed shortly by urging her and helping her swim under the jagged coral and experience the Thunderball Grotto. That's Darrel, confident and all knowing (just ask him). But by far our highlight aboard Sea Boss for the second time, was our renewal. The look on Patty's face as we came out of the Bubbling Pond to see the breathtakingly gorgeous alter Jenn and Darrel had built with fresh flowers, white ribbons, rocks in a heart, and a pearl in a sand filled shell for our 30!!! Quite simply a moment we will remember for the rest of our lives! Darrel and Jenn, you are both amazing and will always hold a special place in our hearts. Our 1st charter was fabulous, thanks to you two! We are so grateful we could re-locate to the Bahamas after Irma and Maria, so that our honeymoon could go as planned! This was truly the trip of a lifetime and the best one we've been on! We were in the BEST hands! * Lazy River, made extra lazy with Darrel pulling us in the kayak! * Channing swimming with nurse sharks. * Feeding the pig! (And swimming to them from the boat) * Thunderball Grotto snorkelling. * Channing catching a Mahi with Darrel. * Jenn's Kraft Mac N' Cheese (disclaimer by Jenn- "They made me do it!!!") and chocolate chip cookies. * Channing's love affair with the dinghy! * Last but not least, the beautiful SEA BOSS!! Thank you for the 1st class treatment, taking care of me while I was sick and for keeping us fat and happy ALL week! 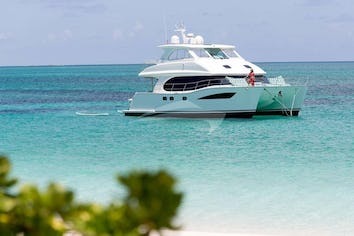 We hope to charter again with you both in the BVI. A truly wonderful vacation. This has been a first class cruise from the food, location and hospitality of the crew. My wife and I have been to the Bahamas many times but this was just the best trip ever. Thanks for everything.I second everything Fred said, best vacation ever. What an amazing week aboard the Sea Boss!The food, fun island trips, farkle, fellowship, fishing and fun cocktails all added up to a FANTASTIC TRIP! You guys are amazing and I hope our paths cross again! As our week comes to a close we want to thank you for a fabulous time. From the fine food to the interesting excursions, you left no want or need unattended to. Truly feeling spoiled right now. You made our 6th anniversary one to remember. Thank you so much for an awesome week and going that extra mile to personalize it for each of us. The food, activities and your company made this a perfect family trip for our family. What an amazing way to end our vacation! We already had an epic week and then you came along and took it up a notch.We loved the food, the fun and the conversation.Can't wait to get back to watch the shooting stars on the Sea Boss. We can't thank you enough for this amazing experience. We were SO spoiled. You two are the best. We appreciate the fantastic meals, company, comforts of home and all our excursions. We had a fantastic time. Thank you. Happy New Year! 2017 Couldn't have started off any better! Thank you for enduring my Kenny Chesney obsession! We sure hope our paths cross again soon. This has been the best days ever. You guys have a such a chilled out atmosphere with the perfect timing and taste on food and beverage. I could live here if God blessed me so. This was amazing. The boat. Darrel and Jenn. The days on the water. You guys are really amazing and made this one of the most fun and memorable trips of our life! The food and drinks were good too! Darrel and Jenn made this entire trip. What an incredible experience you both gave us! From the wealth of knowledge, to the incredible and endless food and drinks, to the great times together we had... Thank you so very much fro the memories of our Sea Boss experience with you, we will take with us for always. Wishing you the both best ahead, I hope we meet again. Thank you for being so wonderful! You have made this trip so memorable. I so appreciate the lovely (vegan!) food, the drinks and the conversations. Thank you for taking exceptionally good care of us... and for taking care of our 'war wounds'!! My wife and I had the opportunity to spend several days on Sea Boss this past fall and our experience blew away our expectations! We arrived in St. Thomas and were met at the airport by Sea Boss captain, Darrel Hearne, who had a car waiting for us. We headed to Yacht Haven Grand Marina where Sea Boss was docked, and were met by Jenn, our wonderful Chef. After a delicious lunch (exceptional food would be the theme throughout our stay), we were on our way to lovely Peter Island. During the trip, we enjoyed the excellent ride of the Horizon 60 catamaran and became acquainted with the various lounging areas aboard. The captain anchored us in a discrete but protected area of the bay, and after some delightful snorkelling, we spent a relaxing afternoon ashore at Peter Island where we managed to squeeze in a little shopping. We returned to Sea Boss for a 4 course dinner and spent a peaceful night aboard. The following day, after an amazing breakfast, we cruised to Scrub Island, enjoying the comfortable and quiet ride of the catamaran. In what seemed like no time, we anchored in a secluded but well protected spot just west of the Scrub. The very experienced, captain Darrel, again used his local knowledge to place us in the perfect spot! We enjoyed time in Scrub Island’s 2 level pool before returning to the boat to enjoy the water toys. Later we took the very fast dingy for a tour of the island before returning to the boat for yet another wonderful meal while enjoying the company of the captain Darrel and chef Jenn! The following morning we had to return to St Thomas but even that trip was memorable. Darrel used his rather extensive knowledge of the islands to give us a waterfront tour, including interesting historical facts. It was a lovely way to spend the day. Overall we could not have picked a better boat for the trip. Captain Darrel was professional and knowledgeable, Chef Jenn prepared amazing meals, snacks and boat drinks, and the accommodations were perfect. They were the very best of hosts! The master stateroom rivals what you would find on a 100’ yacht, and the stability of the catamaran while anchored is unbeatable. Needless to say, we have already booked a week this summer so the family can experience Sea Boss! What a wonderful time we had yesterday! 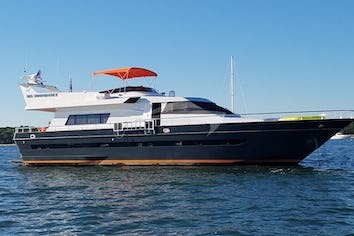 My husband and I, along with our two friends, spent the day on Sea Boss, while visiting the BVI’s. We met Darryl and Jenn at the marina in the morning and they helped us escape to a beautiful and peaceful wonderland for most of the day. We first went to a beautiful cove where we enjoyed beautiful scenery. We then went to Peter Island. The ladies spent valuable time at the spa and the men relaxed on the beach and explored the grounds of the resort. Darryl and Jenn were very gracious and were the perfect hosts. Jenn prepared breakfast goodies and then, on our return, brought out even more delectable treats. Darryl was knowledgeable of the area and was able to provide facts and historic tidbits about many of the neighboring islands. We really enjoyed our day on Sea Boss! What an exquisite vessel! It was absolutely the best part of our trip! Thank you so much for creating such a special and memorable experience for M, the kids and I. Our expectations were blown away with every aspect of the trip. From the comfort of Sea Boss to a great itinerary, to Darrel's question each morning ("So, what do you want to do today?") to Jenn's phenomenal cooking, and attention to every detail by both of you. J and L had a great time and a well deserved break before their senior year in college. Gabriel tested every angle of his bed during his 20 hr/day koala style sleep and "nap" sessions, M fell in love with boating and staying overnight at the beautiful and calm coves that you found for us. Form me, it was a way of experiencing the BVI as I never had before, and simply loved it. I also came out of the trip with a few change orders for our new boat :-) I hope we will see you again soon and thanks for this amazing experience! Every single second exceeded our expectations! Not only do you have a beautiful yacht but combined with such a knowledgeable and experienced crew makes for an unforgettable trip. Jenn your food was simply amazing and you are absolutely adorable!! Thank you for the most idyllic vacation ever. Kelly, Ryan and Rosemary and I had a great time with you guys island hopping in the BVI! The food was amazing and the hospitality off the charts. The memories that you guys provided will forever be etched in our minds!!!! PS. the kids just loved wake boarding. Darrel, you were right and they both got up! You truly are THE BOSS. "Thanks for the a memory of a lifetime! The only really valuable thing you can give someone is a memory. This trip was amazing." Dean P.
"What a great time. Won't want to go back to Chicago. How do I get adjusted? Must plan to do this again soon - with you all! Thanks for the great food, drinks, sorbet, etc and most of all for each of you. You understand good customer service. " Phil P.
"What an experience! 5 of the best days of my life - thank you guys for the hospitality and really making the trip one to never forget. I will return and when I do there better be some wind baby!" Guy P.
"This experience will be re-lived often...great work! I highly recommend Sea Boss and her crew!" Mike S.
"Wow, "exceeding my expectations" is a serious understatement. You coordinated 2 boats, 12 people, visitors, and young adults eager to learn every possible water sport with ease. Ed and I looked forward to this, our last Spring Break with the college crowd, with such anticipation and you provided an experience filled with surprises. Patient instruction was given to all the paddle boarders, wake boarders, skiers, snorkelers, and divers. Darrel, your relaxed and ready for action demeanour allowed the group to go nonstop and fully appreciate the beauty and adventure of this beautiful ecosystem. Su, you literally anticipated every need: delicious and nutritious meals, creative and divine snacks, cocktails, creative tables, and party themes and every other comfort. Thank you from the bottom of our hearts." Love Ed and Linda A. "Wow, what a week! Thanks for showing us a great time for our spring break (woohoo!). Darrel's wakeboard lessons, Su's amazing meals and snacks, combined with your personalities made this the best vacation yet. Thanks so much for everything, we'll be back! See you soon!" "Thanks for the best spring break ever! Y'all were so much fun and kept our stomachs very satisfied and happy!" "You guys are like really funny. And y'all were super nice to me pretty much all week. This has been my favourite week of my whole life. Seriously, you guys are great and I'm going to miss you a lot. Thank you for everything. Well I think it's time for me to hit the old dusty trail.... "
Out in front of the rest! Your SEA BOSS holiday awaits! Adventure awaits in Sea Boss! At the end of the Rainbow... Pot of Gold!